After today’s day-long meeting in Southwark of the trustees of the Anglican mission agency, United Society Partners in the Gospel (USPG), I am on my way to Lichfield, where I am staying overnight before attending a regional meeting of USPG volunteers in Birmingham tomorrow (Friday). I am staying overnight in Lichfield at St John’s House, a 17th century Regency house with adjoining stables that has been lovingly restored and brought back to life by Dan and Eleanor Ralley and converted into a 12-bedroom Bed and Breakfast house. It is seven or eight years since I last stayed in this house in March 2010, shortly after it had been restored lovingly by Sarah and Johann Popp, who had bought the house in July 2003. It now has a Library Bar and a Pavilion room, as well as a relaxing drawing room. 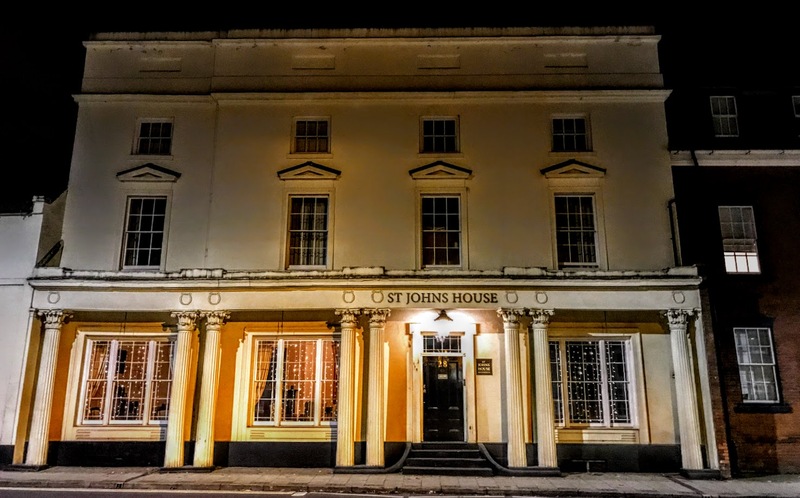 This Grade ll* Regency converted house is right beside Saint John’s Hospital, where the chapel has been like a spiritual home for me since it played an important part in the development of my adult faith at the age of 19. I am also just a short walk from Lichfield Cathedral, which played an early role in prompting my understanding of a call to ordained ministry. My regular return visits to Lichfield are always a pilgrimage for me. Tomorrow morning, before catching the train from Lichfield to Birmingham, I plan to visit both the Chapel of Saint John’s Hospital and Lichfield Cathedral. Sadly, I am going to miss the cathedral exhibition on Elias Ashmole, which came to an end today. This exhibition has celebrated the birth of Elias Ashmole in Lichfield 400 years ago on 23 May 1617. But hopefully, during this quick visit, there will be opportunities to visit the Cathedral Shop, to browse in Lichfield’s bookshops, or even to have a quick coffee with some old friends.